Brady Tkachuk scored a third-period goal and again in the shootout while Jake Oettinger held Canada at bay in the shootout as Team USA claimed a 4-3 win in the first-ever outdoor game in the World Junior Championships. Former Terrier Kieffer Bellows also scored in regulation—with an assist from Oettinger—and in the shootout. For Oettinger, who was rostered on last year’s gold-medal U.S. squad but saw no game action, it was his first on-ice appearance in this year’s WJCs. He made 19 saves in the game at New Era Field in Buffalo, played with snow falling throughout the contest. Canada scored twice on first period power plays before Bellows got the U.S. on the board late in the second. 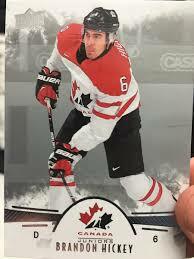 But after Oettinger turned aside a breakaway, Canada’s Boris Katchouk’s long wrister eluded a screened Oettinger to restore the two-goal lead. 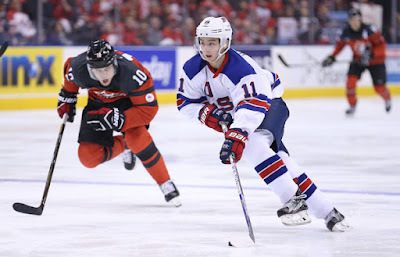 Six minutes into the third period, Team U.S.A. cut the lead in half and 34 seconds later, Tkachuk got inside position on his Terrier teammate and Canadian defenseman Dante Fabbro to bang home Casey Mittelstadt’s pass from behind the net. After a scoreless overtime, Bellows and Tkachuk converted on Team USA’s first two shootout attempts and Oettinger did the rest, denying four Canadian attempts. The preliminary round for Group A concludes on Sunday with Team U.S.A. skating against Kasper Kotkansalo and Finland, while Canada will face Denmark. Finland meets Slovakia today. Jack Eichel’s 14th and 15th goals erased a 3-1 New Jersey lead and the Sabres went on to defeat the Devils, 4-3 in overtime. Danny O’Regan scored his seventh goal in AHL San Jose’s 6-5 OT win against Stockton. Sahir Gill scored his 10th goal in AHL Rochester’s 2-0 win against Toronto. Chris Bourque assisted on three goals in Hershey’s 4-2 win against Springfield. Bourque, who leads the AHL in scoring with 39 points (11G, 28A) in 34 games, is a candidate for the 2018 US Olympic team roster, which will be announced on January 1. Terriers close out the year with a pair of games against Princeton at historic Hobey Baker Rink. Today’s game begins at 3 p.m. and the New Year’s Eve contest starts at 1 p.m. With a pair of wins, BU (7-9-3) can even its record. BU will be without leading scorers Victoria Bach and Rebecca Leslie who are skating with Team Canada at the 2018 Nations Cup in Germany, beginning on Wednesday. 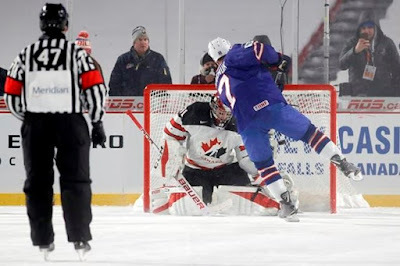 Team USA rallied twice from one-goal deficits, but gave up a late goal and dropped a 3-2 decision to Slovakia in a preliminary round game of the IIHF World Junior Championships in Buffalo. Freshman Brady Tkachuk scored Team USA’s first goal, tying the game in the second period completing a 2-on-1 rush with St. Cloud’s Ryan Poehling. Tkachuk, who led all skaters with six shots on goal and was named U.S. Player of the Game, had nearly given the U.S. a lead in the first period when he rang a shot off the post. Team USA outshot Slovakia 45-25. Team USA is back on the ice this afternoon meeting Canada in an outdoor game at New Era Field with puck drop set for 3 p.m. ET. The game will air live on NHL Network. Terrier captain Brandon Hickey assisted on Canada’s first goal in its 4-1 win against HC Davos in the Spengler Cup tournament in Switzerland. With the win, Canada earns a spot in the semifinals. The senior from Leduc, Alberta had a game-high 20:53 of ice time. ►Hockey writer John Hoven tweeted that names under consideration for the U.S. Olympic hockey team include Jordan Greenway, along with 2009 national champion co-captains Matt Gilroy and John McCarthy. Gilroy currently plays for Jokerit in the KHL, while McCarthy is captain of the AHL San Jose Barracuda. 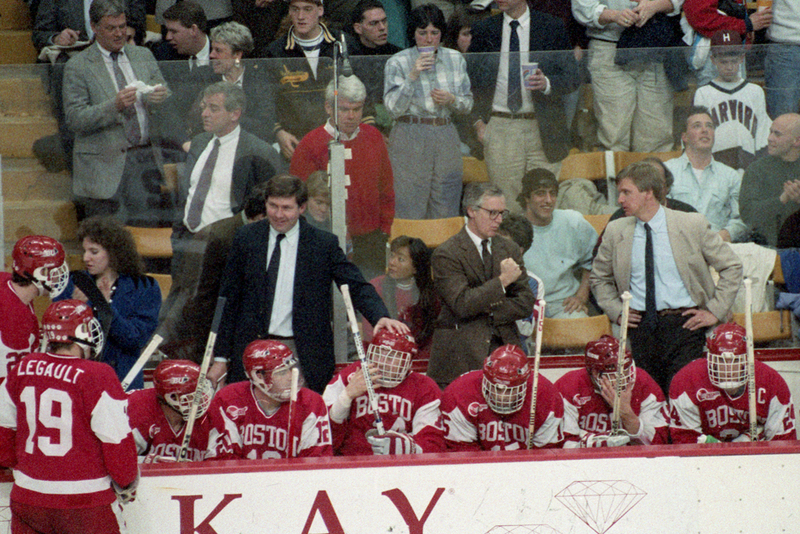 ►The Boston Globe looks at the “different paths” to the U.S. Hockey Hall of Fame taken by recent inductees including legendary Terrier coach Jack Parker and Ben Smith, a former Terrier assistant, Northeastern head coach and Women’s U.S. Olympic coach. 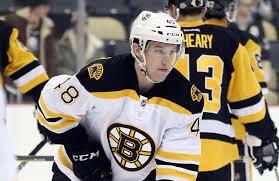 Defenseman Matt Grzelcyk had his first NHL multi-point night, recording two assists in the Bruins’ 5-1 against Ottawa. 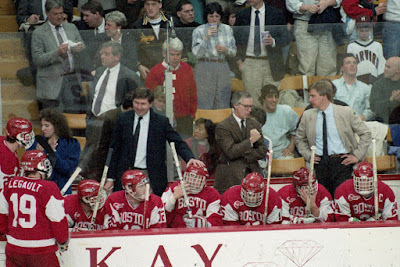 The former two-time Terrier captain and All-American was +3 for the game in which Boston skated 10 former NCAA players. Clayton Keller’s 17th assist set up the game-winning goal in Arizona’s 3-1 win against Colorado. Jakob Forsbacka Karlsson scored a goal and assisted on a late game-tying score in AHL Providence’s 5-4 shootout win against Utica. 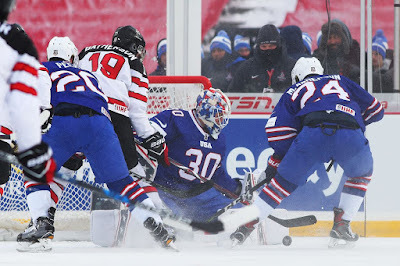 Patrick Harper scored a goal and an assist, while Brady Tkachuk recorded an assist as Team USA rolled past Denmark, 9-0, in its first preliminary round game of the IIHF World Junior Championships in Buffalo. Former Terrier Kieffer Bellows scored twice, including a penalty-shot goal in the second period. Jake Oettinger was the back-up goalie and is expected to get the start on Thursday when Team USA plays Slovakia. Also in preliminary round action, Canada—with Dante Fabbro in the line-up—defeated Finland, 4-2, with Kasper Kotkansalo on the blueline. Canada next plays Slovakia on Wednesday, while Finland’s next opponent is Denmark on Thursday. In its opening Spengler Cup game in Switzerland, Canada defeated Mountfield HK, 5-3. BU senior captain Brandon Hickey logged 22:02 on the blue line for Canada. Sports Illustrated profiles senior Victoria Bach pointing out that she will begin her second semester with BU all-time goal and point-scoring marks within her reach. With 23 goals, Bach leads Division 1 and is third in scoring with 40 points. She is the only Terrier to score 20 goals in each of her four seasons.